Day 3 signalled the start of Group C with co-hosts Gabon facing debutantes Niger in the early game before group favourites Morocco took on Tunisia. Despite fears of empty seats earlier in the week, the home Gabonese crowd packed out their sparkling new Stade de L’Amitie in this opening clash of group C. With an atmosphere buzzing well before kick-off, the fans’ expectations were clear. They weren’t disappointed. From the first blow of the whistle Les Pantheres were on top and creating chances. A very early and very heavy Chicoto tackle on Mouloungui was perhaps intended to insight fear into the Gabonese forwards before they were able to get going. It failed. 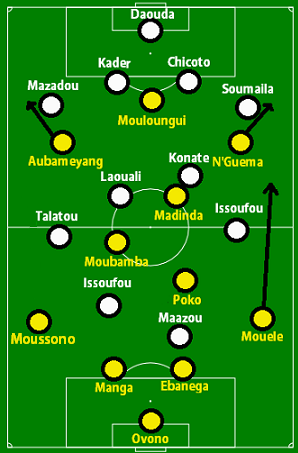 Throughout the opening minutes Gabon posed a constant threat, particularly from the right side where the rotating forwards and overlapping fullback Mouele ran riot. A few crosses led to poor clearances and half chances from the edge of the area but it wasn’t until the 18th minute that Gabon really looked like they'd take the lead, when their answer to Neymar, Pierre-Emerick Aubameyang found himself in space at the back post, however a poor effort straight at the keeper kept the score at 0-0. At this stage, Niger seemed incapable of forming any real threat; committing few to the attack they constantly appeared outnumbered at the top of the field. In frustration at the lack of opportunities Dante Issoufou slide in recklessly on Moussono and was lucky to stay on the field. It didn’t take much longer for Gabon’s pressure to pay off. Once again exploiting the space on the right side, N’Guema was free to swing in a high cross which floated straight over Nigerien keeper Daouda and was met by Aubameyang who this time made no mistake. Despite the narrow angle, he was able to guide his header perfectly back across goal and into the net sending the crowd into bizarre raptures of Poznaning joy. Niger responded to the goal by being somewhat more adventurous when in possession, committing a lot more bodies to attack than they had been previously. Whilst this left vast areas of space in which Aubameyang frequently looked dangerous, it did seem to be giving them the best means of getting back into the game. Niger’s first corner came with 5 minutes left of the first half and the second shortly followed, Talatou and Dante forcing a double block from the Gabonese defence. Their hopes of equalizing though, were dashed just before the whistle – a fantastic challenge from centre forward Mouloungui freed up Moussono on the left, whose cross was met by Aubameyang’s diving header. Daouda saved well but could nothing about the follow up from N’Guema at the back post. With a 2-0 lead, Gabon went into the break looking the sure victors. And so they were. The second half failed to match the excitement of the first as Gabon looked tight at the back but more interested in conserving energy than adding to the scoreline when driving forward. The start of the half saw a few opportunities fall to Gabon as the Nigerien fullbacks, seemingly instructed to pressure their Gabonese counterparts were constantly out of position, allowing Aubameyang and N’Guema to raid the empty wings in the final third. As the half progressed, the best chances sprung from defensive errors, with the Nigerien defence being caught in possession, slipping and miskicking on separate occasions. Niger nearly managed to give the home side a potentially worrying final 10 minutes as Boubacar, cutting in from the right, played a well weighted ball onto Maazou’s head. The striker directed the ball low but Ovono got down well to save. Although he was a surprising omission from the starting line up, Daniel Cousin’s late introduction saw a few more efforts fired in on the Nigerien goal and a couple of worthy penalty claims turned away but having secured the 3 points, the Gabonese players and fans alike weren’t bothered about any failure to add to the scoreline. Niger may be the easiest opposition they’ll face, but well-structured at the back and fluid in attack with some real pace, Les Pantheres look very impressive and must now have their eyes firmly set on progression, perhaps more. In a thoroughly fascinating and entertaining game Tunisia overcame their North African rivals to put themselves in a good position to progress as group winners. They may have been rivals to outsiders, due to being located in the same region of the world, but in their time in Gabon been anything but. Sharing a hotel together in Librevelle, they’ve also been spotted going to the mosque for prayers together. So despite this being a derby you’d have been a fool if you had a bet on a red card or sat yourself on the couch for a night of crunching tackles. Tunisia came into the game with a reticent 4-3-1-2 system that has become synonymous with the Italian Serie A, the bedrocks of Ayman Abdennour, Karim Haggui and Ammar Jemal vital to the solidity of their defence, the omission of Oussama ‘Daraginho’ Darragi, the best African-based player in 2011, raising eyebrows. Despite widely being tipped to start as an attacking midfielder or out wide on the right, Younes Belhanda, a player who has featured in many of the Player to Watch’s – including this humble site’s – started as a central midfielder in a 4-2-3-1 system for Morocco. For much of the first half, the Montpellier man controlled the tempo in midfield, on one occasion fashioning a chance for himself after a couple of stepovers although he did occasionally make risky passes which indicated that it wasn’t his usual position. Chamakh’s alter ego to the one we see week-in-week-out at Arsenal did much of the talking, inspiring the team-mates around him, presumably telling them not to play like his alter ego at Arsenal. Tunisia’s rugby forward Abdennour took a particular liking to him, hugging him at every possible set-piece. I suppose someone has to make up for the lack of affection Chamakh gets at Arsenal. Back to the point, keeper Ayman Mathlouthi had a busy half, pulling off saves from the Arsenal man and the man he was linking up with – Mbark Boussoufa. Tunisia’s goal, then, came against the general balance of play, Belhanda’s misplaced pass put Benatia in trouble. The resulting free-kick by Khaled Korbi floated through the air, avoiding everyone and taking a bobble into the ground before avoiding the keeper’s despairing hands. A common problem during qualification for Morocco was the lack of goals – with 4 of the 8 goals they scored coming in a single home game at home to Algeria – and with Tunisia now happy to sit back and hit them on a counter the longer they game went on, the more threatening they would become. Adel Taarabt was brought on at half-time, presumably to stop him walking out in a tantrum. The temperamental attacking midfielder looked lively, forcing a save from the keeper. The energetic Youssouf Hadji also came on and came the closest equalising with a sumptuous ball over the head a la Gascoigne Euro 1996 v Colin Hendry, only to completely screw up the finish by miscuing it high and wide. 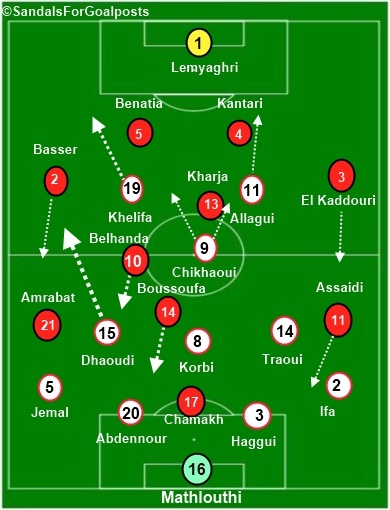 The openings were few however, with Tunisia’s 4-3-1-2 outnumbering the Morocco forwards. Zouheir Dhaoudi was a constant threat down the left-wing, offering an outlet with his skill and pace on the ball, keeping right-back Michael Chretien Basser stationed in his own half. The introduction of Youssef Msakni, known as ‘Little Mozart’ for his ability to dictate play, proved decisive as his slaloming, zig-zaggy run took him past two Moroccan defenders and finished with a cool, Mehdi Benatia-deflected shot low to the left. Morocco captain Housseine Kharja’s rallied his troops with a goal back stemming from a corner, which shouldn’t have stood as it was offside, and nearly won it in injury time his shot after a neat skill going narrowly over the crossbar. Tunisia held on and should now surely be the favourites to advance from this group. A tricky tie against co-hosts Gabon awaits Morocco, with the nation full of confidence, spurred on by the home crowd and with the lack of goalscoring prowess in the Morocco team, a surprise exit for the Lions of the Atlas could be on the cards.